My accommodation is good for couples, business travelers, families (with children) and furry friends (pets). 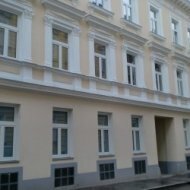 Large apartment, centrally located, located on the 2nd floor (street side) of a multi-party house in the 15th district of Vienna municipality. Furniture consisting of table and four armchairs, sofa and wall shelf with TV. - Complete kitchen: 2 hotplates, microwave, AMC cookware, Martello coffee machine, sink, dishwasher, fridge / freezer and kettle. Hair dryer, including bath and hand towels. In front of the house there are public parking spaces along the street. There is a short-term parking zone from Mon-Fri (weekdays) from 09:00 to 19:00 at the address. During this time, tickets are to be laid out (Attention: parking duration - at one location (parking) max 3 hours). Parking the car for a longer period using the Park & ​​Ride System. Various supermarkets and restaurants are nearby. 10-15 minutes walk to the Schönbrunn Palace with animal park, 5 minutes on foot Metro U4 / U6 Station Längenfeldgasse and the Westbahn City with several train connections, Metro U3 / U6 and various tram lines. eg. the journey time by metro U3 from the Westbahn City to the center of Vienna Mitte, Stephansplatz is 8 minutes.